Cheating! Denial! Dice Whining! Rules Lawyering! Turn the most annoying things about games into fun with The Worst Game Ever! Poking lighthearted fun at all of the things we hate in games, gamers, and gaming, each card represents a pet peeve and the mechanics of the game turn them into fun for everyone! 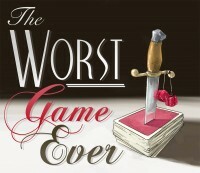 Add a Review for "The Worst Game Ever"